As Labor Day approaches, a Quaffmaster's mind turns to thoughts of American history. Or, possibly, childbirth; I imagine that mothers of children born on Labor Day view the irony with gaiety and laughter*. But in this case, I have chosen to celebrate the approaching festival with a review of a soda which, by its label, calls to mind nostalgic visions of my nation. The drawer pulls are supposed to be reminiscent of old-style buttons on a smart waistcoat, suitable for a gentleman of leisure. Americana Vintage Soda Root Beer has an American flag high on the label. The "Vintage" designation is undoubtedly designed to call to mind idyllic afternoons, in which one would ride down to Mr. Friendly's corner market with one's pack of lovable rapscallions to trade in nickels and dimes for a glass of genuine root beer and a bag of licorice whips, to be consumed whilst sitting by the local creek and listening to that new rock-'n-roll music which would mildly scandalize one's parents. One wonders what sort of nostalgic reminiscences of Earth-That-Was a ten-year-old today will have of his or her youth when said ten-year-old is eighty and living in a retirement pod on one of the Inner Worlds**. In any case, this bottle firmly fixes the chronological target of the intended reminiscence by pointing out, on the side of its label, that it is bottled (by Orca***) in a 50's style bottling plant. I'm not completely clear on what that means, except that I suspect there are matronly ladies, rulers held at the ready, roaming the conveyor belts, alert for impropriety and necking in the dim corners of the factory floor. 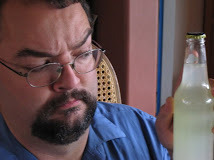 We've tried two others from Orca's Americana line, the Black Cherry (which was justifiably recommended to us, and reviewed at the Madonna Inn) and their Honey Lime Ginger Ale. Both were tasty. Where and when: I'm dealing with a backlog of Weird acquisitions, so I'm not honestly sure where this came from. Or when. However, the K-i-C won't let me get any more until I deal with some of this. Color: Dark brown, ever-so-slightly more yellow than the deep red of some root beers. Decent head at first pour. Scent: Fascinating. A sweet smell, which first strikes me as a bit citrusy, with cream and spice, but I have some trouble nailing it down...and then I get it. Cinnamon toast. It smells like cinnamon toast! Or maybe cinnamon rolls. This is a good thing. It's quite clear and smooth, strongly spicy/cinnamon, cream-ish, sharp. Not much of the more herbal/bitter you get on some other root beers, not a lot of gentian or coriander. K-i-C: "Smells oddly like Sweet tarts. It's got this chalkiness, tablet-y. Like licorice Sweet Tarts." She's not as fond of it as I am. Me: "I thought it smelled like cinnamon rolls." K-i-C: *doubtful* "It smells like something you're supposed to chew." You chew cinnamon rolls! I am declaring victory. Taste:Very sweet, quite smooth. The traditional root beer flavor is there, with the aforementioned cinnamon strong among them. Notably smooth; almost disturbingly so. Hints of tart linger at the edges, but not nearly as strong as a Sweet Tart. Licorice is also present. Vanilla is another very strong component. Actually, the vanilla and cinnamon are almost too strong; it's on the far sweet/sharp border of what I would even call root beer. That's not to say it's bad; I actually like the taste quite a bit. Let's get some other opinions. I summon the rest of the staff. Me: "Hey, guys. Come taste this Weird soda." Me: "I'd like you to taste it without knowing." Nazgul: *suddenly trudging, rather than running, to the Lab* "Oh, <i>no</i>..."
Olorin: "Hmm. Chocolatey cola root beer. Like a mix between chocolate, cola, and root beer. I like it." I see what he means about the chocolate. Nazgul: "It's good. Has Mama tried it?" Me: "No, she didn't like the smell." So this one gets approval from me, Olorin, and Nazgul, but fails to win over the Kibbitzer. This isn't all that unusual; the K-i-C fills the (scientifically critical) role of Lab skeptic on soda matters. As far as I'm concerned, this is a worthy contribution, if barely root beer. A very interesting, pleasant taste and texture. Quaff rating: 4.0. Could be more complex, but lovely in its simplicity. Cough rating: 0.5. Maybe just a bit too sweet. Not completely a root beer. * In the years after childbirth, anyway. ** "Hey, you browncoats! Git off mah lawngrid!" *** I presume the company, rather than in the sense of "made by killer whales".